First off, I want to thank Bea Lee for this amazing hop that inspired me to dust off an old book and make something from it, large or small. I chose this book, "Herloom quilts"
I love fans, so why not! Rummaged through my Island Batik Scraps....yes, I know, they are a mess. For some reason when I fix them up, in no time at all they get in there and play and this is what I get! The fans were so much fun to make. I was so tempted to just make a quilt and I still might. Makes for a different table runner! It is different, adds a punch of color, and is a conversation piece. These creative quilters, artist, are amazing, please go by and visit, leave a comment if you have time. I have the DELIGHTFUL DESERT by Elizabeth Hartman as well but I really really liked the bunnies in this one. It would be nice to make the larger quilt but I am starting out small because we all know it might end up in the UFO pile is I go larger..... sad to say. This is so much fun, like putting a puzzle together. I am using Island Batik fabrics "Flea Market" and the 5" stash builders that came in my new box. The 2" strips are perfect for this project (except if you need larger pieces and that is where the 5" strip stash builders comes in). Can I just say, I am looooooving this. The idea is to find an old (to you) quilt book on your shelf and make something from it which can be anything. I can't wait for my day! If you have been with my blog and reading for sometime, you would know that I am an island girl at heart. I have always said I was born in the wrong place. Here is a little picture of my pineapples which I never got to pick. It has been nine years and I still miss my friends and the little island out in the South Pacific. I chose to do a little Island Mini. I knew immediately what I wanted to do. So I searched the internet for Island pictures. Here is the one I chose. Arranged the pieces how I wanted them. Then did a little thread work. put on a sleeve, and there you have it. I used mostly Island Batik scraps but did open a roll or two of my new stash builders. 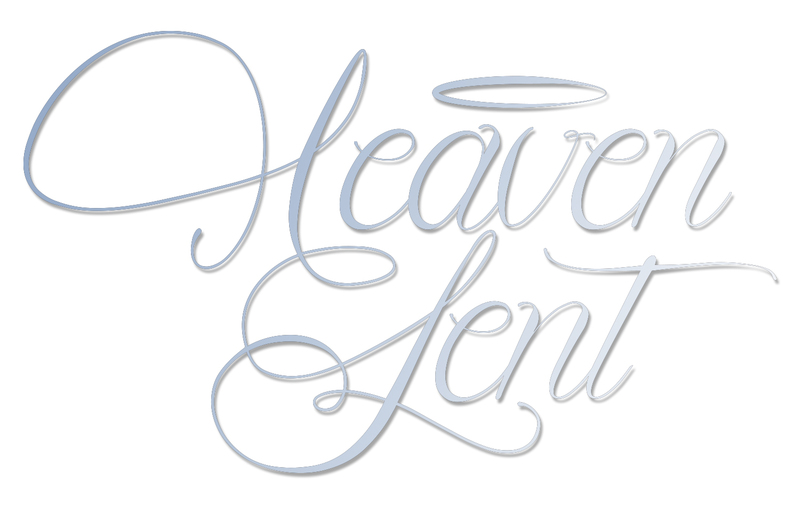 I am giddy just writing this post. Oh yes, they decided to keep me for another year! The box is my first box of the year of Island Batik Goodies. As an ambassador, we get two boxes of Island Batik fabric, Hobbs Batting, Aurifil threads. We are asked to do a certain challenge each month with what has been sent and post about it. Love the surprise packages, which will be revealed in July and trust me when I tell you that Island Batik knows me all so well when they sent me these fabrics. Will you look at all of this? Stash builders - 5" wide the length of the fabric strips. I have already open these puppies up and started using them. Island Batik Rayon and scarf. The scarf has been worn!! Can I say that I love it! Can I say double yummy? Can I say triple yummy??? LIME GREEN and PURPLE together??? I am minding my own business, walking out the door and low and behold this is at my door!! Can I say double excited? I had the eyes of an owl when I saw this box. This is what was in the box. I was so excited about the QUBE that I immediately started playing. 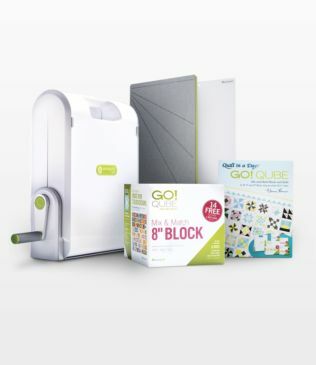 To be honest, I was not familiar with the QUBE and was not that interested until I got one. All I can say is that it makes it so much easier to piece. I don't consider myself to be that great of a piecer but this QUBE has made it simple and easy. A big thank you to Island Batik, Hobbs batting, Accuquilt, and Aurifil Threads!!! See my husband's office? We call it his shed but he has his computer etc in there. When you come out of my house you look to the right and there is my husband's shed. My sewing room was (moved now) off of the back door. One day as I was looking out my window. I saw the FED X truck. All of a sudden my head gets light and I get giddy. I start running out the door. I see my husband coming out of his shed. He sees me running, jumping, and carrying on like a lunatic. Oh yesssss....we were saying...it is here, it is here...as I am jumping and running. My husband said later that I was a sight to behold. What you see now is the bumper of my husband's truck...yep...that is where the FED X guy backed up to give my my B0X. My husband knew not to even go up to the truck and retrieve my BOX. Trust me, it was a heavy box but you don't hear me complaining. Then as my husband was going back to his shed, I called out to him. Do you see how big this box is???? He was probably thinking, will she ever grow up? I WANT TO FLY WHERE THE REINDEER FLY! I want to fly where the Reindeer Fly. Over mountains, hills, valleys, and skies. I want to see what the Reindeer See. Up Up and away we go! 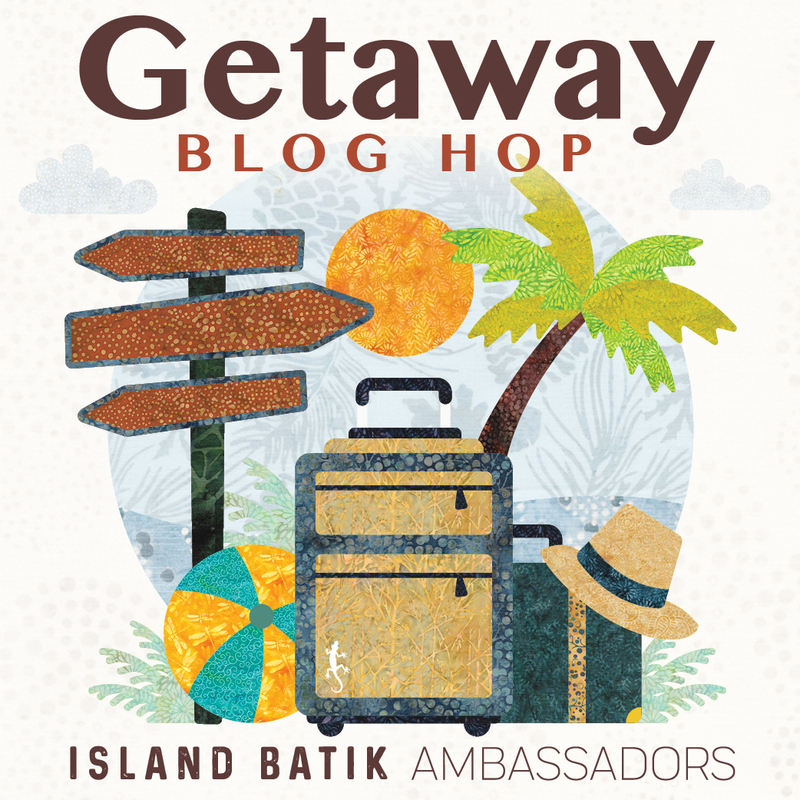 This is my day and final day for the Island Batik Getaway Blog Hop. There are some amazing designers out there. They have done some awesome quilts, techniques and wonderful giveaways. If you have time, it would be well worth your while to go and visit them. I have had these quilts done for a while and it has been so hard not to show them especially at Christmas. My plans were to make a king size quilt but sometimes things do not go as planned. Wonderful Aurifil Thread, as you can see this color is my favorite. I have gone through a bigger spool and several smaller ones. I truly do love Aurifil, I have purchased some from Missouri Star Quilt co.
Make up this awesome quilt! I call it "Where the Reindeer Fly"
Then because my plans got foiled, I made this second quilt. Makes a nice throw for sure. The colors show up better in the second quilt. Got in another pickle and well....as you can see above, I used the Accuquilt go heart die to fix my one problem. Which made an amazing border. Now it is time to snuggle down with some cookies, cocoa, and my Kindle light. What better way to fly where the reindeer fly than in the imagination. Don't you just love all the awesome fabrics Island Batik creates? Just click on the above link and you will be transported to the Island Batik site where you can enter to win. Doesn't hurt to try, right? For my giveaway, I am giving away to one person two of these patterns of choice, they are PDF so it would come to you in your email. Below is the list of ambassadors, if you have time to go and visit. 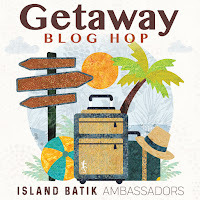 We all know how busy we are but when you go to Island Batik"s Blog you will find the ambassadors and the fabric line, you can pick and choose that way. Either way, have fun and Enjoy! !